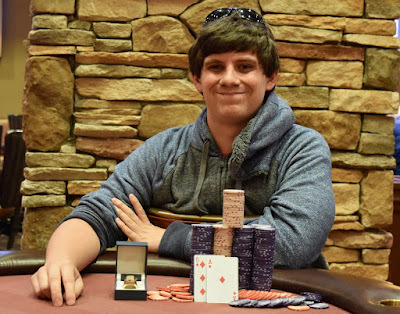 The inaugural @WSOP Circuit @Thunder_Valley Main Event title goes to Nick Pupillo, who outlasted a field of 528 entries to earn $170,286, the Circuit Ring and an entry in the invitation-only WSOP Global Championship $1 million freeroll. A relatively-fast final table saw Pupillo begin play 4/9 in chips with a little more than 1 million. Jed Hoffman started the action going by eliminating the first two players - Roque Quiambao (9th, $15,800) and Steven Tabb (8th, $19,855). Casey McCarrel eliminated Glen nLarson in 7th ($25,304), then Dann Turner went on a tear, knocking out three players in half of a level. Turner amassed a huge stack by eliminating Paul McCaffrey in 6th ($32,710), Hoffman in 5th ($42,879) and Paul Richardson in 4th ($57,016). Pupillo knocked McCarrel out in 3rd - a $76,911 cash - to get heads up with a little more than a 2-1 chip deficit to Turner. It was Turner running the table early, moving up to a 5-1 lead before Pupillo found his first double, moving to a 7m to 3m deficit. That double seemed to give Pupillo new life and new energy. The cards and the big bets began quickly going Pupillo's way. Once he gained the chiplead, Turner never recovered and Pupillo earned the victory. Here are all the payouts.